Give thanks to God who is good : whose steadfast love is eternal. The phrase in the second half (in bold) is added to each verse, presumably in the original text. Such short statements in each verse continue, the repeated antiphon of the second half of the line above being repeated and further abbreviated to quoniam or just qm (see lower right of the illustration) to save space. These short statements remind the reader of all the major events related in the five books of the Torah: the wonders and sustainment of creation, the history of the Exodus, the parting of the Red Sea and the conquest of various kings in taking of Canaan, the promised land. Ironically, in the following Psalm 137, the glory days have passed and they sing the lament of captive exiles, ‘By the rivers of Babylon’. These days the facts of the story are better known than they are relevant, save as an inspiring if remote myth of divine guidance and protection. Did the Red Sea really roll back at the right moment then roll back, as Miriam sings in Exodus, to consume pursuing horse and rider? In poetry the detail is less important than the message. The ride is sometimes more fun than the destination. The stories of the psalms are no exception. Heinrich Schütz (1585-1672) wins the prize for producing a startlingly grand motet on Psalm 136. Assuming the major congregations or patrons of the day had such resources to hand, he arranged the piece for up to four choirs or smaller groups of voice, brass or other instruments, together with a figured bass continuo. Illustrated here are the last few bars, in 17 staves, of the 200 bars of this piece. Each staff shown here is edited for voice with text underlay but in all probability some would be instrumental. One edition has Cantus 1 taken by trombone. 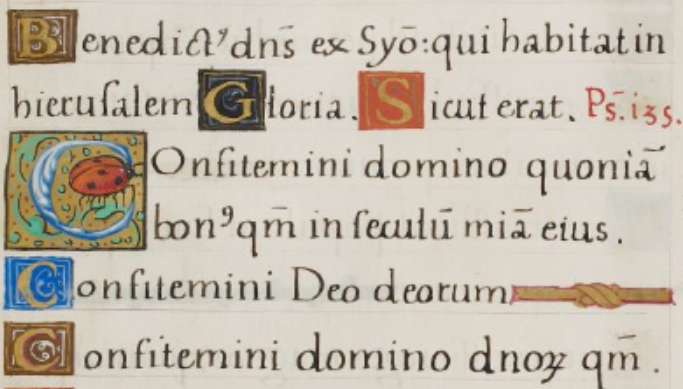 On a more modest scale, several modern psalters provide a short tone (Psalms For All Seasons 136D) or background vamp (The Emergent Psalter) for the first phrase, then a refrain for the antiphon in each verse. They often include John Milton’s rather dated hymn Let us with a gladsome mind; interestingly, PFAS 136B updates and vamps it up a bit with new rhythm, an echo voice part and refrain — Genevan adapted. New Century cunningly starts with the “Steadfast love …” phrase of the repeating antiphon but adapts it by adding a response that invites the congregation to participate more personally. Rather than continuing “… endures forever”, the refrain concludes ” … surrounds those who trust in God”.